I’m still trying to zip my pants after all the great eating I did last week! 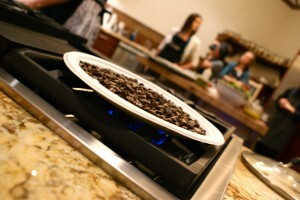 But it’s no surprise that I’m feeling a little indulged after visiting the Thermador test kitchens. Thermador is a brand that has always been associated with high end cooking, and their test kitchens are a testament to that legend! The food that their chefs prepared for myself and the fabulous bloggers I was honored to travel with was nothing short of dreamy. What really got me about it all was seeing this fab food prepared right in front of me, almost effortlessly. Salmon Wellington, Beef Tenderloin, Creme Brulee. These are not the sort of things I regularly attempt in my kitchen. But the chefs and the equipment at Thermador not only made it seem possible. They made it actually possible for us to accomplish ourselves as they walked us through the steps. Blowtorch anyone? We were there to see the equipment, but the piece de la resistance was Thermador’s new steam convection oven for home kitchens. This oven does all sorts of incredible things that will make your microwave fear for its very existence. Steam/convection ovens can defrost food super fast (without the yucky dry semi cooked edges). 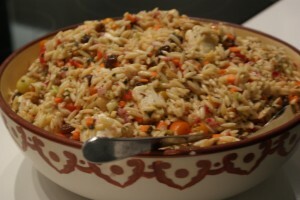 They can cook fish and veggies at the same time with zero transfer of flavor, preserving vitamins and texture of food. Steam is the word when it comes to succulent slow roasts. You can cook a whole turkey in a steam oven without getting up at the crack of dawn on Thanksgiving. And perhaps most (sadly) significant in our home, you can reincarnate cold pizza in five minutes. It’s utterly amazing that part. The combo of steam and convection will bring that pizza back to it’s original fresh baked state so fast you might never resort to cold pizza for breakfast again. Steam convection combo ovens are the secret tool of great bakers worldwide and make for better breads as well. After seeing how fast the steam oven reheats food I really was starting to take stock of what I use my microwave for. Coffee? Warming milk? 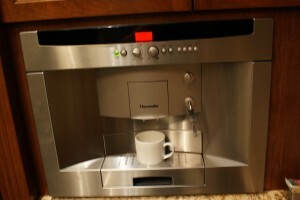 Uh oh microwave… Thermador has another device for that. this coffee maker that I also fell in love with. It’s enough to make me stay home from Starbucks. Other noteworthy, product lust inducing Thermador finds from the day spent at Thermador included their gas range with the signature star shaped burners and an extra low heat setting that prevents scorching and is able to hold your food warming on the stove for longer periods of time. How low does it go? Check out this photograph of chocolate chips that we melted on a paper plate. This sort of blew my mind. I’ve never been a big fan of the double boiler. I’ve also always thought gas ranges were a necessity for the true chef but Thermador has sort of changed my mind about that as well. In the past gas was better because it had the visual aspect that induction/electric ranges did not. Instant visual feedback – look at the pot, look at the flame, adjust and correct. Much harder to do with an electric range, right? But the induction ranges from Thermador with SensorDome have one upped the gas range. They use an infrared light on your pot’s ceramic coating (or on a semi permanent sticker that can be added to any cookware) to monitor pot temp and are able to keep your food precisely set to the right temp. That means better frying and pots that never boil over. Not that I ever walk away from my simmering pots and come running back into the kitchen to a big screaming mess. Who’d do that? 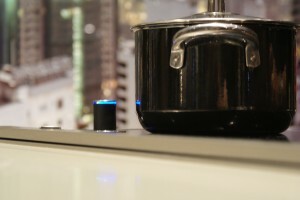 Here is a pic of a pot being “watched” by Sensor Dome. It’s boiling. Just not boiling over! I could go on and on and on about all the wow, I want that, I gotta get that equipment we saw but I needed to save room in this post for the food. The food! The Thermador Chefs shared some awesome recipes with us and I have to share a couple of them with you including these two incredible salads from Chef Kyle Jacobi. 1. Combine all ingredients, except for pasta. Fold in pasta. Refrigerate for a day. 1. Mix Yuzu with honey and Dijon, whisk in olive oil gradually until all gone. 2. 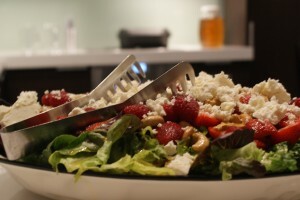 Assemble lettuce on platter, dress with strawberries, cashews, pour dressing over salad finish with cheese. Add salt and pepper. If you are stuck in a dinnertime rut I suggest you check out the culinary center on the Thermador Site for even more amazing recipes. Thermador’s gracious and inspiring chefs are whipping up delicious food everyday just for people like you and I to try out at home. They are so good at what they do! Many Thanks to Thermador and the amazing team of bloggers I met on this adventure. You may turn me into a bonafide foodie yet! 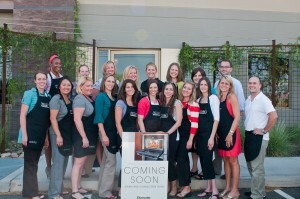 Disclosure: Thermador flew me to Arizona to visit the test kitchen and provided accomodations and food while there. My opinions about the brand are my own. I’m actually a third generation Thermador owner/user.